I’m all about cold, refreshing meals and sides at the moment. As the temperatures rise, so does the deliciousness of cold food. 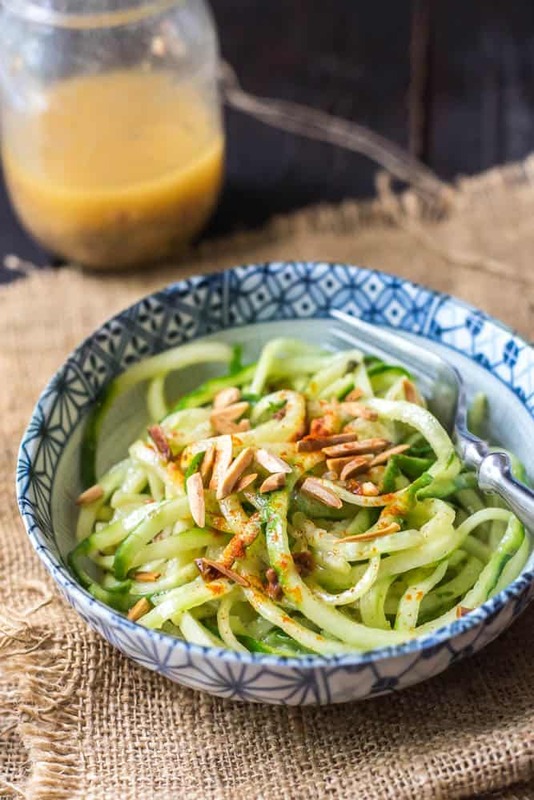 Today, we present to you our suuuper simple Cucumber Noodles with Sun-dried Tomato Vinaigrette and Toasted Almonds. This little bowl of yumminess literally comes together in 5 – 10 minutes. Ain’t nobody dare complain about that – especially when it tastes this good! Simple is just best, amirite? We started out by popping a tray of almond slithers into our little toaster oven for a couple of minutes. 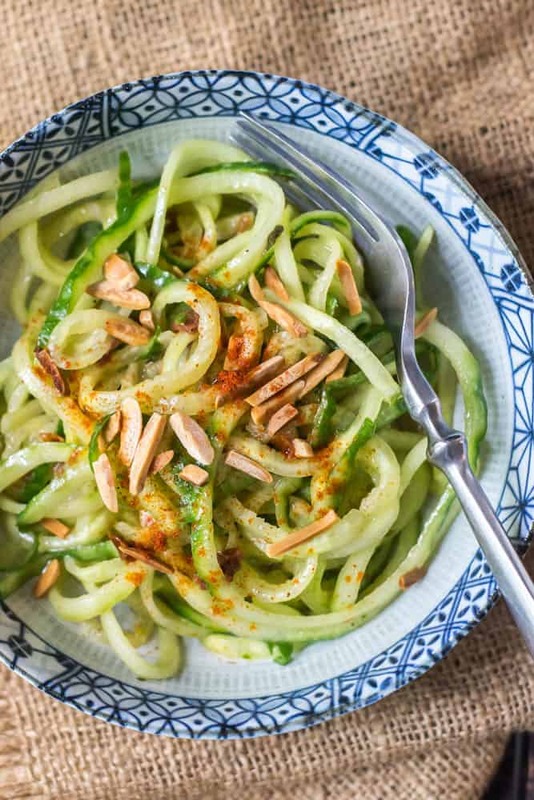 While the almonds were becoming crunchy and golden, we quickly spun a large cucumber through our little Vegetti spiralizer. Then, we poured all the goodies for the vinaigrette into a mason jar, shook it up, and splashed it over the noodles. Finally, we removed the almonds from the toaster oven and sprinkled them on top. Easy! This can be eaten by itself as a light lunch or even served as a side to just about anything else. It will lighten and brighten up any meal! And don’t be afraid to add chicken or some avocado or whatever else you like. 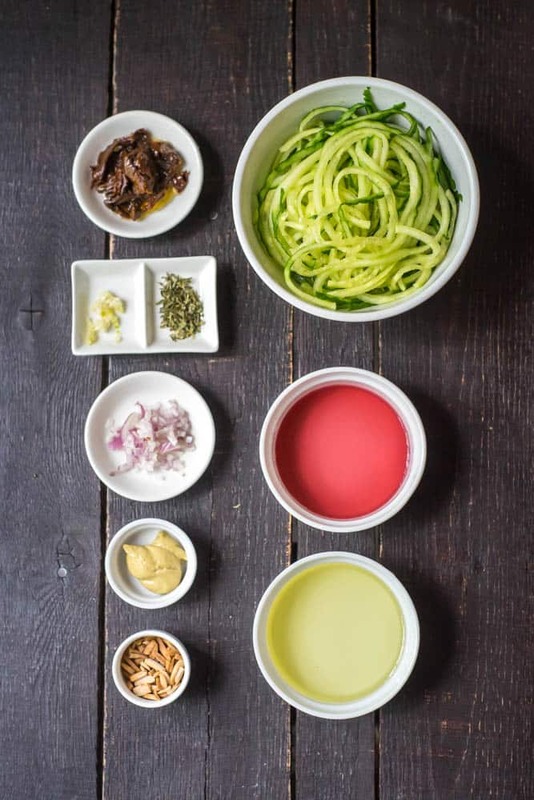 It’s a perfect base for experimentation – the vinaigrette goes awesome with everything! I’m so darn happy to finally be able to eat relatively normal again – Baby Chirpy is 12 weeks along now! Avocado and mushrooms are still a no-go, which makes me very sad, since they are two of my absolute favourite foods. I can’t wait to love them again and pretty much overload every Chirpy recipe with them like I used to! Haha! In other news, we haven’t made much further progress with our tiny house, but be sure to keep checking (LINK), because we’re going to start framing soon. Yeeee! I still can’t get over the excitement of having a brand spanking new kitchen to do all our Chirpy things in. It’s definitely going to give us a big boost in the motivation department, if you know what I mean. Blogging is fun and I love every second, but it sure does take a lot of time! It’s been a bit of a chore lately, seeing as I’ve been feeling so low energy. Apparently that (just like nausea) is supposed to get better once I enter the second trimester too, so fingers crossed! 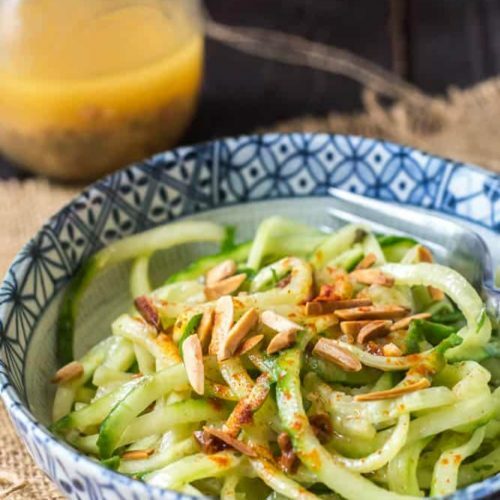 Toss the cucumber noodles with some of the vinaigrette. Top with the almonds and sprinkle with some paprika if you like! Such a great idea. My kids love noodles so i think I will make a little trick in the kitchen ;). It’s fun tricking kiddies into eating healthy! Hope yours fall for this one ??? ?